We are what we think - what are your thoughts making you? My post last week of What if you were immortal got my mind to thinking about my life in general and my belief that we are what we think. I can say with confidence that I strive to live my life to its fullest, to surround myself with my passions and to follow my dreams. I also feel that I’m truly blessed to have the drive, desire, willingness and ability to do this. Not everyone is so lucky. Having said that, does it really come down to luck, or is it more about our mindset? Typically speaking I’ve been somewhat timid about voicing my personal opinions on many topics, simply because I’m not one to seek out conflict or debate, and lord only knows how the Internet loves to breed that! But I have to admit that this is something that I feel rather strongly about. I’m not saying that I’m looking for argument here, but I would be interested in hearing about other opinions and perspectives. My perspective is such that I believe that everyone, truly everyone, has the ability to shape their own lives. There really is only one thing that holds us back – and it’s our internal dialogue. Which is why the quote “We are what we think” resonates so much with me. I do realize that many people are faced with circumstances that are beyond their control. They may have an illness, or a handicap, or live under circumstances that are restrictive by any number of means. I’m also not an expert in any way on other countries – my experiences are primarily within Canada, so I really can’t speak to the limitations created by geography. However, from a logical perspective, what I can speak to is how powerful the mind and will are. Granted there are circumstances that can’t necessarily be “changed” such as various illnesses. But just because a person is literally incapable of doing “A” doesn’t mean that they can never find something between B and Z that would bring them joy and happiness. Life is what we make of it. And the only thing that holds us back from making it something wonderful is what we think. 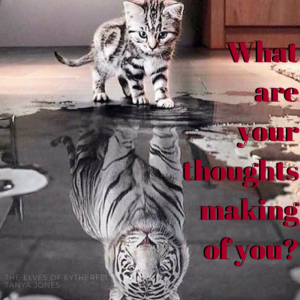 We are what we think – what are your thoughts making of you? So why dwell on it? So what? Does it really matter what a person CAN’T have or do? I’ve never understood the rationale behind that way of thinking. If something truly is unattainable for totally legit reasons, move on… pick something different. We live in a world where there are opportunities literally surrounding us everywhere. The only possible reason for someone to be miserable and unhappy with their life is because they choose it to be that way. They choose to focus on what they can’t have or do instead of channeling their focus and energy into things that they can have or do. Me… I choose to live. I choose to make as much of every moment that I possibly can. Does it mean that I have everything I want? Or that I’m awesome at everything I do? Or that I do everything in my life right? Or that I’m better than anyone else?? But I am happy. I’m grateful for what I do have. I aim to do better. I dream in colour. I do the best that I can. I don’t give up because something is difficult, but I also don’t beat my head against a brick-wall or try to do things that will ultimately make my life miserable. If I run into roadblocks, I go around them, over them, blast right through them, or I change direction as the situation calls for. I do what makes sense for me – no one else. I truly believe that we are what we think, so I am very mindful about what I think about. I encourage you to do the same. If you’re experiencing difficulties or hardships or are facing insurmountable mountains, maybe it’s time to take a step back, to take a look at the bigger picture and ask yourself if this particular mountain is truly worth your time and energy, or if perhaps there is something else that you could be channeling your thoughts and energy on. 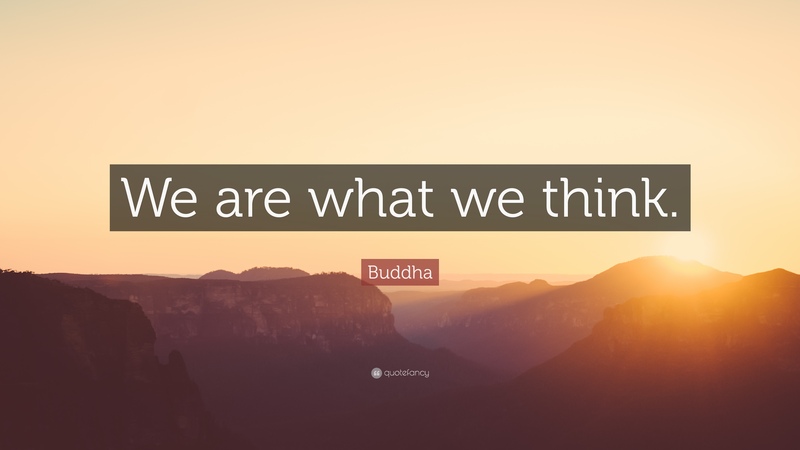 We are what we think – so what are your thoughts making of you? ← What if you were immortal? Yes indeed, unless one has the misfortune to be in prison or a hostage I guess one always has choices, large and small. Go off and be adventurous whatever your family or friends say. Or the opposite, be unadventurous, admit if you’re not coping; escape the stress at work and find an ordinary job, less well paid, but better for your mental health. No one has a right to live or work in a particular place; if you can’t find a job or a place to live go somewhere else. If you are depressed or just bored, start something new, anything – a cliche, but it works.